Four of our most prized decks in one convenient (and discounted!) package! Over 40% Off…Plus, FREE domestic shipping! Exquisite Bold – Conjuring Arts found a small cache of this rare, colorful and much heralded deck from Expert Playing Card Co.®. EPCC’s Exquisite Bold deck set a milestone in printing by incorporating foil directly on the playing card backs. 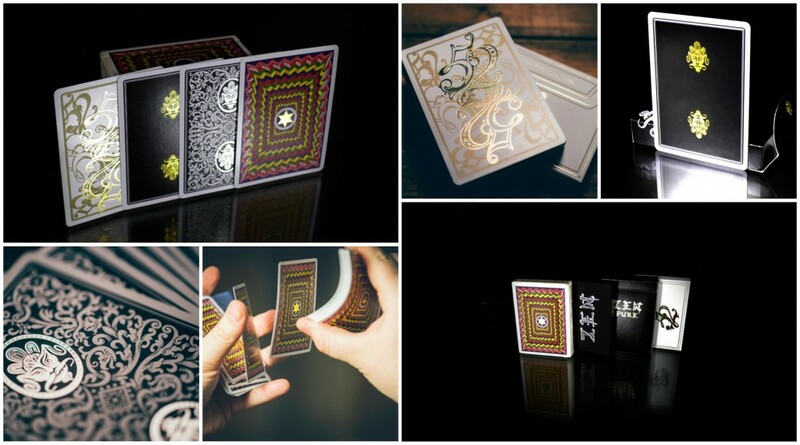 Aside from the stunning and revolutionary design, it has proven to be an extremely popular deck for cardists due to its superior handling and EPCC’s signature Master Finish. Royal Zen – The first deck to reveal the Expert Playing Card Co.®‘s iconic Zen logo. The decks are a classic white bordered deck in a black back design featuring the Expert Playing Card Co.’s signature Zen logo in silver foil with ornate scroll work comprising the rest of the card. The fantastic back design is a reproduction of a very old and extremely rare deck of cards. Zen Pure Gold – A fashionably stark version of the Zen deck, the solid black back design creates the perfect backdrop for the stunning gold logo. 52 Plus Joker Gold – This commemorative deck designed by Jackson Robinson was specially created for the 52 Plus Joker convention last year. We were lucky to have been able to craft a small run of the design in an exclusive gold foil and a tuck case made of a special paper which is water and tear resistant! This special offer is limited to 100 sets! Act quickly to take advantage of this fabulous deal!